This Fourth of July weekend, I had a lot of cheese. OK, not real cheese, because if you’ve ever been to South America, you’d know they haven’t mastered the art of cheese yet. I’m talking about sentimental cheese; standing in the middle of a crowded house party discussing how great America is kind-of-cheese. As an English teacher, it’s been pretty easy to make other American, English-teacher friends. Isn’t it funny? I came here to submerge myself in a foreign culture, yet I yearn to speak my own language with other natives. This was one of those occasions. A friend of mine from Houston decided that since Chile wouldn’t be recognizing July 4, and we would all surely be homesick this weekend, he would throw a party at his tiny 15th floor apartment. Our job was to bring a “very American” dish to share. As you can imagine, there was a lot of meat: homemade corn dogs, chicken wings, ribs and Carolina barbecue. I brought a cake in the shape of an American flag, with blueberries as the stars and strawberries as the stripes. When it was time for the cake, everyone hushed their chatter and wiped their meaty mouths. My Texan host made quite a scene of this cake. I was blushing. 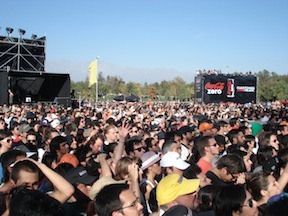 Hundreds of thousands of Chileans and tourists flocked to Santiago for Lollapalooza Chile to see such American acts as Kanye West, The Flaming Lips and The Killers. Also note the Coca-Cola sign in Spanish at the concert. Next thing I know, I was standing in the middle of an apartment in Santiago, Chile, belting out the lyrics and high notes to the star-spangled banner with 40 other English teachers. It was loud, it was off-pitch, it was probably a little obnoxious for his neighbors, but it was the most American I’ve felt in awhile. In all seriousness, one of the most important things I’ve gathered from this journey is a greater appreciation of home. Not just because it’s what I’m used to. Yes, I miss the convenience of Target and Jewish bagel delis, but more than anything, I am so grateful that I get to call myself a citizen of a country that most other countries are striving to be. Although Chile stays true to its Latin American roots, the fashion, music, pop culture, and even architecture are all trying to be chameleons of American style. 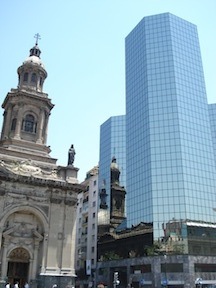 A stark contrast between old Italian and new American-style architecture in historical Plaza de Armas. Amidst the incredible amount of change Chile has experienced in the last 40 years, there are still many aspects of Chilean society that remind me how lucky I am to be a “gringo”. One of the issues that students are protesting now is their right to free education. Upward mobility is nearly impossible in Chile, because students who go to public schools and universities typically don’t get hired into high-paying positions. It’s a relentless cycle that, in the United States, would never be tolerated. I saw no fireworks this weekend. They are illegal here. I wasn’t on a boat in a lake in North Georgia, and I didn’t get to eat a slice of watermelon. This is my first Fourth of July that I’ve spent away from home. But to my surprise, it was also my most meaningful.